Take a stroll through a pet store and you’ll realize that not everyone is a cat or dog person. There are those who love to cuddle tarantulas, feed rats to large snakes or watch gerbils run in circles for hours. Some how, Richard Simmons has always reminded me of a gerbil. I’m a cat woman, myself. When you commit yourself to cats, a love of birds flies right out the window. It’s too much torture for both species to live under the same roof. Kind of like those two political parties in Congress. One day last week, I glanced out the back door and saw Sammy the Siamese Terrorist playing with something bright yellow. I thought it was a rubber duck but that didn’t really make any sense. Then I decided it might be a baby chicken, though we don’t have any chickens in this neighborhood. So I dashed out the back door to see if I could save the poor creature before Sammy did him in. Imagine my surprise when I looked down and saw a real live City Bird. I wasn’t sure if this bright yellow kid was a canary or a parakeet, but I knew he was far from home. I scooped him up from Sammy’s clutches and held a trembling, wounded bird that immediately took his little beak and bit my thumb with all his might. I howled all the way into the house. I was pretty relieved especially when he pried the bird’s beak off my throbbing thumb. SOG demanded a shoe box, water, bird food and then went to work. He examined this bright yellow creature only to discover that one of his eyes was a bit bloody and wounded. No matter. SOG said he could be saved. So I went up to our local gas station/ice house/bait and tackle shop and posted a sign: “Found. Either a canary or a parakeet. Please call if you lost one.” The old timers sitting around the table didn’t believe me and thought I was playing a joke. To convince them, I had to swear on a stack of lottery scratch-offs. 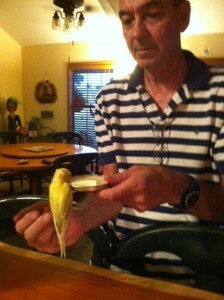 By the time I got back, Stroke had fed the bird and calmed him down. He was looking a bit perkier, but he was looking with only one eye. That’s when we came up with the name One-Eyed Jack. I called my Resident Bird Expert friend and was informed that because Jack had a curved beak (the kind that can do permanent damage to a thumb), he was indeed a parakeet. We never received a call from anybody saying they were looking for a bright yellow parakeet that had flown the coop. I guess those City Folks are dumping their flying friends in the country now because, as far as I can figure, this is not an escapee from a pet store. The next morning, One-Eyed Jack was definitely on the mend. But having one eye can have its problems as he decided to take flight and flew right into the ceiling fan. A little dazed, Jack headed back to his shoe box for safer accommodations. It is then that we decided it would be a real “tweet” for Jack to have a home of his own. You’ll have to wait till next week to hear what all the flap was about. Spreading laughter throughout the world…one to be continued column at a time.